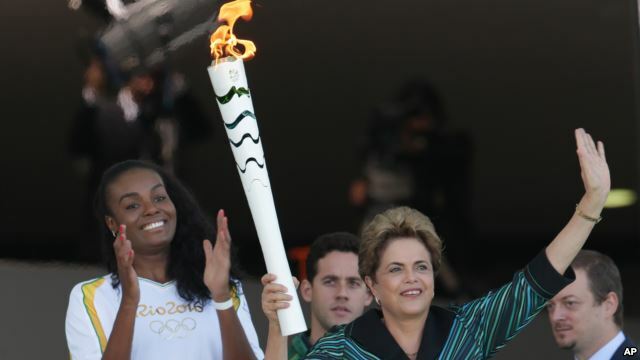 Home Tags Posts tagged with "olympic flame"
Brazil has welcomed the Olympic flame for the start of a torch relay that will culminate with the opening of the Olympic Games in Rio in August. The flame was flown inside a small lantern on a special flight from the Swiss city of Geneva to Brasilia. Brazil’s President Dilma Rousseff lit the Olympic torch which will be carried around Brazil by 12,000 runners. It could be one of Dilma Rousseff’s last public acts ahead of a possible impeachment trial. The Senate is expected to vote next week on whether proceedings against the president should go ahead. If a simple majority votes in favor, Dilma Rousseff will be suspended from office for up to 180 days and Vice-President Michel Temer will take over. Dilma Rousseff is accused of manipulating government accounts ahead of her re-election in 2014. The Olympic torch will pass through more than 300 towns and cities from the Amazon to Brazil’s southern border, arriving at the Maracana Stadium in Rio on August 5. Among the first torchbearers will be a Syrian refugee who now lives in Brazil. The first torchbearer was Fabiana Claudino, who led Brazil to Olympic gold medals in women’s volleyball in the 2008 and 2012 games, and is team captain this time. Brazilian mathematician Artur Avila Cordeiro de Melo ran the second leg. 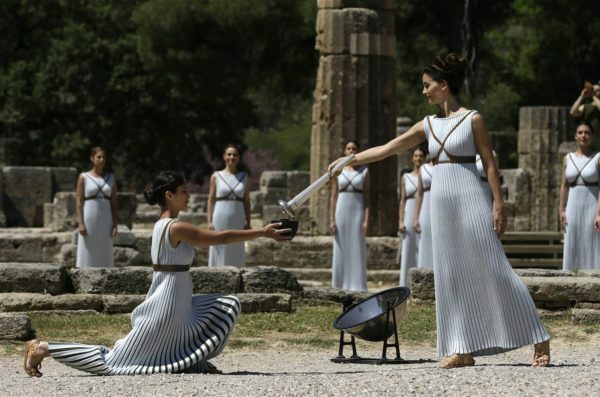 The Olympic torch for the 2016 Games in Rio de Janeiro has been lit in southern Greece. Actress Katerina Lehou performing the role of high priestess lit the torch by using the sun’s rays. The flame will be taken by various runners on an international relay that will culminate at the opening ceremony in Rio de Janeiro, Brazil, on August 5. Katerina Lehou offered a mock prayer to Apollo, the old Greek god of light and music, at April 21ceremony. Wearing a long pleated robe, the actress knelt solemnly to the ground and lit the torch within a few seconds by using a concave mirror to catch the sunlight. Katerina Lehou then delivered the flame to Greek world gymnastics champion Eleftherios Petrounias, the first runner in a torch relay that will conclude at the opening ceremony in Rio’s Maracana Stadium. The chief organizer of the 2016 Olympic Games, Carlos Nuzman, promised to “deliver history”. He said the Olympics would unite Brazil, which is beset by political and economic crises. 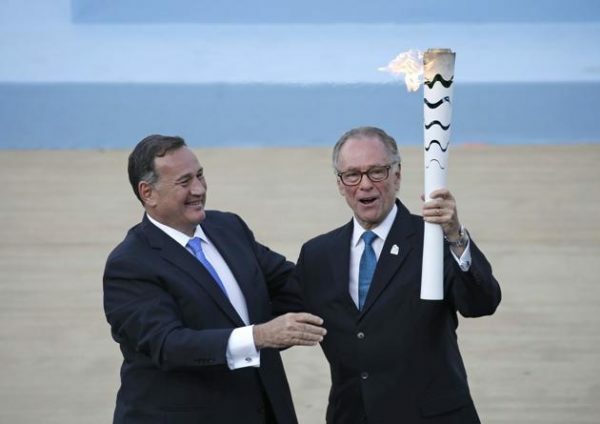 “[The torch lighting] brings a message that can and will unite our dear Brazil, a country that is suffering much more than it deserves in its quest for a brighter future,” Carlos Nuzman said in his speech. Brazil’s President Dilma Rousseff was forced to cancel her trip to ancient Olympia because of the impeachment threat she faces. International Olympic Committee (IOC) President Thomas Bach said the flame was “a timeless reminder that we are all part of the same humanity” despite the difficulties that Brazil is facing. “Rio de Janeiro… will provide a spectacle to showcase the best of the human spirit. In just a few weeks the Brazilian people will enthusiastically welcome the world and amaze us with their joy of life and their passion for sport,” Thomas Bach said. Before the flame arrives in South America it will begin a six-day relay across Greece, passing through the town of Marathon – which gave its name to the long distance race – as well as a camp for refugees and migrants in Athens, the International Olympic Committee has said. The torch is due to arrive in Brazil on May 3 for a relay across the country, traveling through hundreds of cities and villages in every Brazilian state. The Olympic torch will be carried by about 12,000 bearers. The Olympic flame has arrived to the North Pole aboard a Russian nuclear-powered icebreaker, the Sochi Winter Games organizers say. 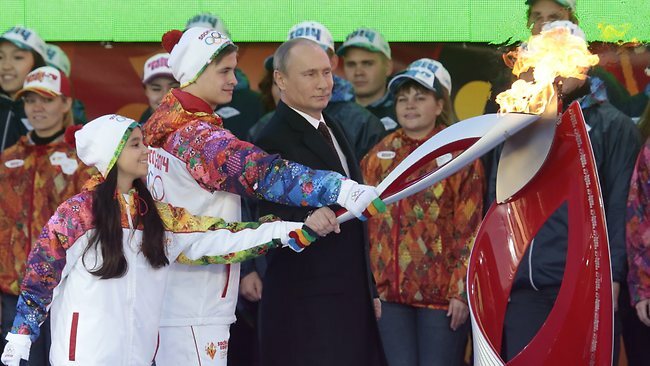 The Sochi organizing committee said in Friday’s statement that the torch relay reached the North Pole on October 19. Russian Polar explorer Artur Chilingarov, who led the mission, lit a special bowl at the North Pole sign. The ceremony involved 11 torch bearers from several countries. The icebreaker, which departed from Russia’s Arctic port of Murmansk, made the journey in about 91 hours, the quickest such trip ever. For most of the 39,000-mile torch relay, the longest in the history of the Olympics, the flame travels by plane, train, car and even reindeer sleigh, safely encased inside a lantern. 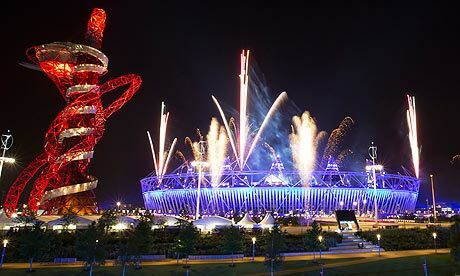 London Olympics opening ceremony is just hours away after seven years of preparations. 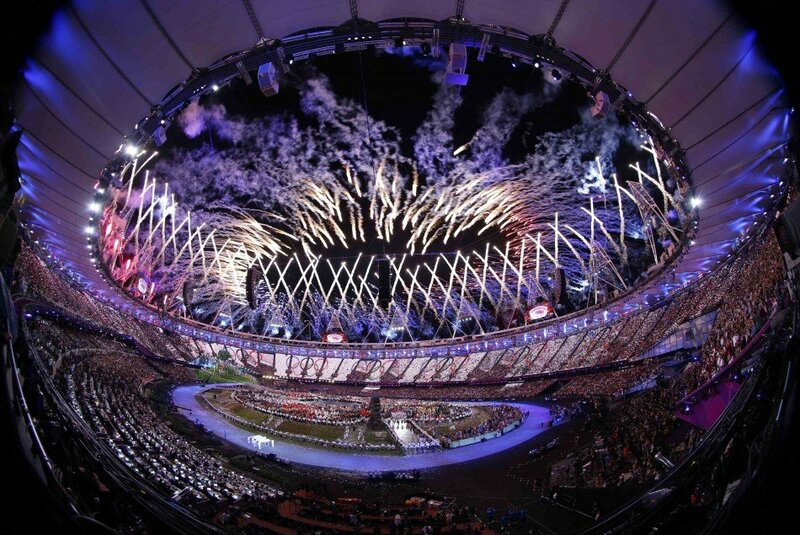 The three-hour spectacle in the Olympic Stadium will be viewed by a global TV audience of around one billion people. The day of celebration began at 08:12 BST with a mass bell ringing. Big Ben rang for three minutes for the first time since King George VI’s funeral. Lord’s cricket ground has turned away spectators trying to get in to watch archery amid confusion over ticketing. The London 2012 website advertised the event’s preliminary rounds as “unticketed”, which some members of the public interpreted as open to the public. 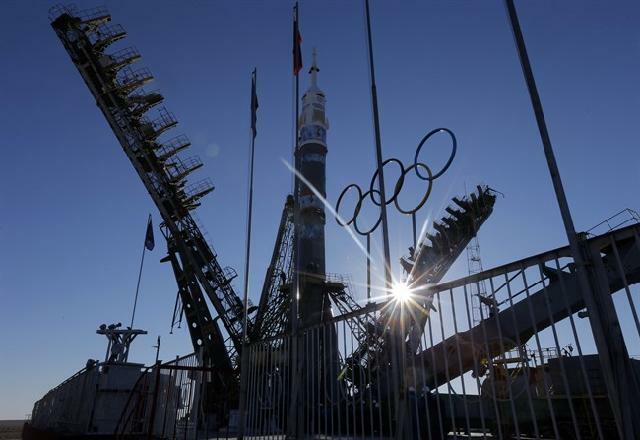 But Olympic organizer LOCOG said it had not advertised or sold tickets for the ranking event and had always made it clear preliminary rounds were not open to spectators. South Korea later claimed the first two world records of London 2012 in the men’s team and individual archery. Meanwhile, the Olympic flame has arrived at City Hall on the Queen’s rowbarge Gloriana after first weaving through the maze at Hampton Court Palace and being carried down the Thames on the final day of the torch relay. Around 50 boats took part in the flotilla, each reflecting London’s waterborne heritage. The flame’s 70-day nationwide journey ends with the lighting of the cauldron during this evening’s opening ceremony but the identity of the person who will take on the honor remains a mystery. Five-times rowing gold medallist Sir Steve Redgrave and two-times decathlon champion Daley Thompson will take part in the closing stages, although neither is expected to light the flame. The ceremony is expected to remain dry, but weather forecasters say the jet stream is moving southwards and there will be a return to more unsettled and chillier conditions over the next few days. There have not been any reports of major transport issues. Network Rail and the Association of Train Operating Companies said most services were running to schedule. Some roads in London were congested around the route of the Olympic torch relay, and in St. John’s Wood where the archery competition began at Lord’s cricket ground. Prime Minister David Cameron said: “It’s a great opportunity to show the world the best of Britain, a country that’s got an incredibly rich past but also a very exciting future. Danny Boyle, the artistic director of the £27 million ($43 million) opening ceremony, dedicated it to the 15,000 volunteers taking part. Europe’s largest bell will ring inside the Olympic Stadium at 21:00 BST at the start of the extravaganza, said to be a quirky take on British life. Some 15,000 sq m of staging and 12,956 props will be used, and the event will boast a million-watt PA system using more than 500 speakers. The crowd of about 80,000 will include the Queen and a host of dignitaries and celebrities. Queen Elizabeth II and Prince Philip will host a Buckingham Palace reception for heads of state and government and an opening ceremony celebration concert featuring Snow Patrol, Stereophonics, Duran Duran and Paolo Nutini will be held in Hyde Park. More than 10,000 athletes from 204 nations will take part in the London Olympics, which has taken £9 billion ($14 billion) of public money to stage. • London taxis staged a protest at Hyde Park Corner over Olympic traffic lanes. The protest was moved forward by three hours after police said they could not demonstrate on the Olympic Route Network from 16:00 to 03:00 BST. 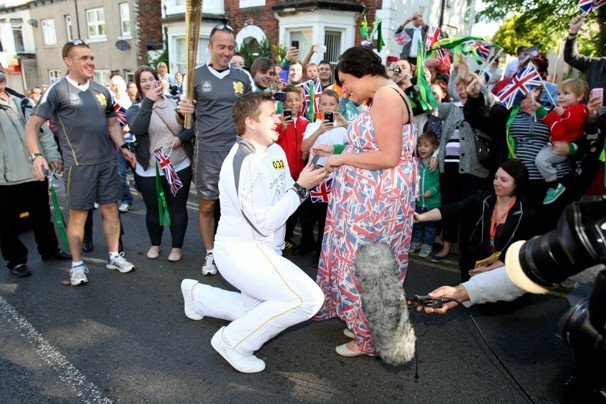 A torchbearer has proposed to his eight-month pregnant girlfriend during day 31 of the Olympic torch relay from Middlesbrough to Hull. David State, 25, from Redcar, who works with the Scout movement and raises money for charity, knelt as he asked Christine Langham, 27, to marry him. She accepted and David State then had to carry on his stint in Loftus, Teesside. David State said it had all been pre-arranged with relay organizers LOCOG, who gave him 300m to run before stopping to propose. “Then I had to keep running with the torch for 300 m after that, so the words <<I’ve got to go>> came out of my mouth as soon as I’d proposed,” he said. He added he was told afterwards that Christine Langham was “surprised” and in “floods of tears”. Some of the biggest cheers of the day were reserved for Margaret “Jean” Bishop, who at 90 is one of the oldest torchbearers of the relay. She is known as the “Bee Lady of Hull” as she collects money for charity dressed as a bee in the city’s shopping centre. She carried the torch amid huge support in the early evening sunshine in her home city. The relay started with the Olympic flame being carried across Middlesbrough’s landmark Transporter Bridge. Crowds gathered to watch as James Coupland, 17, came down from the top of the 225 ft (69 m) high bridge, which is celebrating its 100th birthday. James Coupland helps out with sport at several local primary schools. Earlier in the day’s 109-mile journey, the flame was carried on a steam engine on the North Yorkshire Moors Railway. After arriving in Whitby, the flame was taken on board locomotive Sir Nigel Gresley, which holds the world record for being the fastest steam engine since World War II, achieving a speed of 112mph in 1959. Kelly Williams carried the flame as they travelled to Pickering. The 25-year-old from Scarborough is a PE teacher who has raised more than £20,000 ($32,000) to help underprivileged children in Zambia. The relay travelled through Middlesbrough, Redcar, Marske-by-the-Sea, Saltburn-by-the-Sea, Brotton, Carlin How, Loftus, Hinderwell, Lythe, Sandsend, Pickering, Filey, Bridlington, Beverley and Hull. Other torchbearers among the 133 people who will carried the flame on Monday included Great Britain rower Tom Ransley, 26, who took up the flame in Pickering. Ransley was part of the crew that won silver at the 2010 World Championships. During the morning the relay passed through the Victorian coastal resorts of Redcar and Scarborough, the largest holiday resort on the Yorkshire coast. The evening celebration is taking place in West Park, Hull, where rock indie trio Little Comets and dance act Twist and Pulse are performing. Amy Hopkin, from Hull, was the last torchbearer of the day, carrying the flame into the evening celebration at West Park, where a cauldron was lit during the festivities. The 31-year-old, who has Down’s Syndrome, travels the world as part of a British gymnastic display team. On Sunday, the day’s events started with England cricketer Paul Collingwood carrying the torch through Durham and ended with a party in Middlesbrough. A total of 8,000 people will carry the flame during its 8,000 mile, 70-day journey to the opening ceremony of the Olympic Games in London on 27 July. London Olympic Games organizers have received the Olympic flame at a handover ceremony beneath a rainbow in Athens, Greece. The President of the Hellenic Olympic Committee, Spyros Capralos, passed the flame to Princess Anne, president of the British Olympic Association in the Panathenaic Stadium. Lit in Olympia on 10 May, the flame was taken on a week-long tour of Greece. A British delegation including David Beckham are due to fly with the torch to the UK on Friday. It will then be carried 8,000 miles (12,875 km) by 8,000 bearers in a 70-day relay ending at the Olympic Park. The relay begins at Land’s End on Saturday when triple Olympic sailing champion Ben Ainslie will be the first to carry the torch on British soil. After criss-crossing every region of the UK, the flame will be used to light the cauldron in Stratford’s Olympic Stadium at the opening ceremony of the Olympic Games on 27 July. At Thursday’s handover ceremony, crowds in the stadium stood beneath multi-colored umbrellas as the national anthems of the UK and Greece were sung by a British school choir and a Greek tenor. Heavy rain abated and a rainbow could be seen as the flame was carried into the Panathenaic Stadium – host of the first modern Olympic Games in 1896 – by Christina Giazitzidou, Greece’s world champion in rowing, who held aloft an olive branch of peace in her free hand. Celebrated athletes carried the flame around the athletics track in a relay before the final torchbearers, Greek weightlifter Pyrros Dimas and Chinese gymnast Li Ning – who lit the Olympic cauldron at Beijing 2008 – lit the cauldron in the centre of the stadium, formally ending the Greek leg of the relay. The British delegation included London 2012 chief Lord Sebastian Coe, Olympics Minister Hugh Robertson and London Mayor Boris Johnson. Lord Coe told the thousands-strong crowd that millions of people across the UK were working to get the UK ready to welcome the world, and said the torch would touch every region of the nation on its 70-day relay. 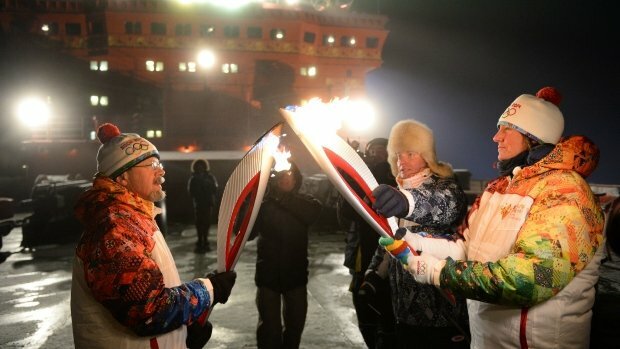 “The story of the flame will be about those that carry it – their stories will inspire,” he said. Princess Anne said earlier the relay was likely to stoke excitement for the Games in the UK, as it had in Canada ahead of the Vancouver Winter Olympics. “When the flame arrives and the torch relay starts to get under way, that is a physical moment in terms of the process towards the Games. Boris Johnson said the torch relay democratized the Olympic experience. “It’s lighting the touch paper of a 70-day fuse that will then go off in the great pyrotechnics of the opening ceremony,” he said. Boris Johnson said the key tests for London 2012 were both whether the Games were well-received, and whether they left a legacy for London and the UK. Hugh Robertson accepted that putting on the Games was a huge responsibility, but said if London 2012 was a success it would be a great advertisement for both London and the UK. Also attending the ceremony were London 2012 ambassador David Beckham and five young people chosen by Games organizers LOCOG and the British Council for their commitment to sport and their role in promoting the Olympic values of friendship, excellence and respect within their school or college. Hailing from different national regions, the youngsters are part of London 2012’s Get Set education network and school linking programmes run by the British Council. After spending Thursday night at the British embassy in Athens, the flame will be brought to the UK by the British delegation on BA2012 on Friday evening, where there will be a welcoming ceremony at RNAS Culdrose in Cornwall. The flame – symbolizing purity because it comes directly from the sun – was kindled at a 10 May ceremony in Olympia by actress Ino Menegaki, playing a high priestess, who caught the sun’s rays in a parabolic mirror. That ceremony took place amid the Temple of Hera ruins, by the ancient Olympic Games stadium. The torch was then carried 1,800 miles through Greece by 500 torchbearers on a week-long route circling the country and travelling out to the islands of Crete and Kastelorizo. 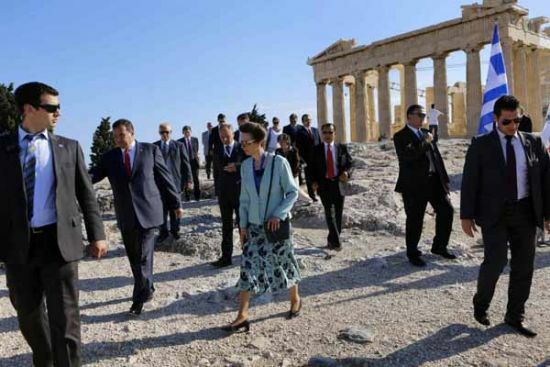 The flame was then “laid to rest” in a ceremony at the Acropolis on Wednesday. Ahead of Beijing 2008, the Olympic torch traversed the globe in a relay dogged by pro-Tibet, democracy and anti-China protests. The 2012 relay has taken place with the backdrop of economic turbulence in Greece, which has been left without a government and possibly on the brink of leaving the eurozone by the financial crisis. Greece has seen huge demonstrations of social unrest in previous months, amid efforts to reach a deal with the European Union on a bail-out for its economy. A flame was first lit at the modern Olympics at the Amsterdam 1928 summer Games, but it was not until Berlin in 1936 that a torch relay route was set out from Greece to Germany.